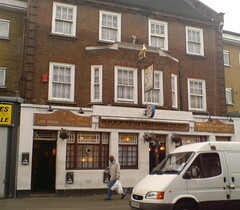 A locals pub on East Street in Walworth. secretlondon visited in September 2008. She had a John Smiths Extra Smooth (£1.25/half). It had no hand pumps, the television was showing horse racing and there was ABBA background music. There is a beer garden outside for smokers. Accessibility: One step to the beer garden and a small step to enter the pub. The toilets are on the same level and had no additional steps. Last edited 2008-09-25 01:34:42 (version 7; diff). List all versions. Page last edited 2008-09-25 01:34:42 (version 7).